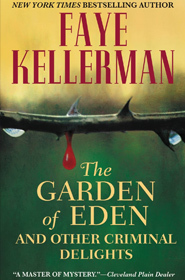 THE GARDEN OF EDEN and other CRIMINAL DELIGHTS is my first book of short stories. The anthology features 17 stories including two new Decker/Rina stories written specifically for the collection. Also of note is two short stories co-authored with my children – The luck of the Draw with Rachel and Ilana Kellerman, and Mummy and Jack with Jesse Kellerman.